If you&apos;re looking for a truly unique experience, head aboard the Pride of the Susquehanna Riverboat for a killer good time. 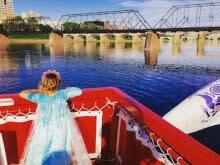 Murder Mystery dinners are one of the most popular events held on the riverboat. Figure out whodunit with classic mysteries performed while you enjoy dinner and a view. Murder Mystery dinners are just one of the many themed events you, and the friends or family, can enjoy while floating down the Susquehanna River. Other popular dinner cruises include Craft Beer Pairings, Fall Foliage Dinners, Fireworks Dinner Cruises and Maryland Blue Crab Feast. There&apos;s something for the kids too! Plan to include the little ones at the Pirates or Princesses on the Pride event. Other special events include Music Cruises, Wine & Cheese Tastings and more. If you&apos;re looking to give it a try without committing to a full event, stop by for one of the daily 45-minute Public Sightseeing Cruises. It&apos;s a great way to experience one of only 6 remaining, authentic, paddlewheel riverboats for a small fee of only $10/adult and $5/kids. If you&apos;re looking for more fun in the area, enjoy dinner with a view along the river at nearby RockBass Grill, Dockside Willies and Dukes Riverside Bar & Grill. You can also find more fun at City Island here and other things to do along the river here.